Samruddhi’s school had given this interesting project for children and parents of identifying the plants whose pictures they had displayed on their notice board. The project included clicking snaps of your children, and creating a photo album with the names of the plants. The treasure hunt began…and we went to a Pathare Nursery near Kalyan station. It is a wonderful place, especially for people who love greenery and who enjoy gardening. All your gardening needs will be fulfilled here. I bought all the plants my terrace from this nursery. The place is well maintained and the helpers over there were quite co-operative. I shall post some more pictures tomorrow. PS: I just noticed this is my 95th post…and I can’t believe…I survivedJ . A special thanks to Preeti, Jack uncle, Gopikaa, KP and Meera. Thank you for all the lovely comments. The cover looks reaally good! Great job! Looking forward to the other pix! Read 2 posts now. It is so good of you to acknowledge good done by Preeti. I have visited her at times. Samu will remember this always and love you for this. 5 more to reach century. Looking forward to that. oh and congrats on your 95the…keep writing ! Jack uncle, Samu was on top of the world…and without her help, it wouldn't have been possible for me to do this..!! 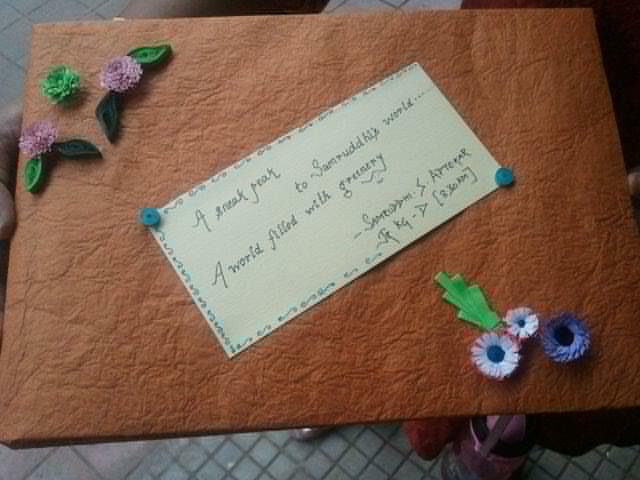 @Dee…thanks a lot, Quilling takes time, but the end result is beautiful. Please give me a call as soon you drop in ur 100th post… I would be giving the comment first…wat say?